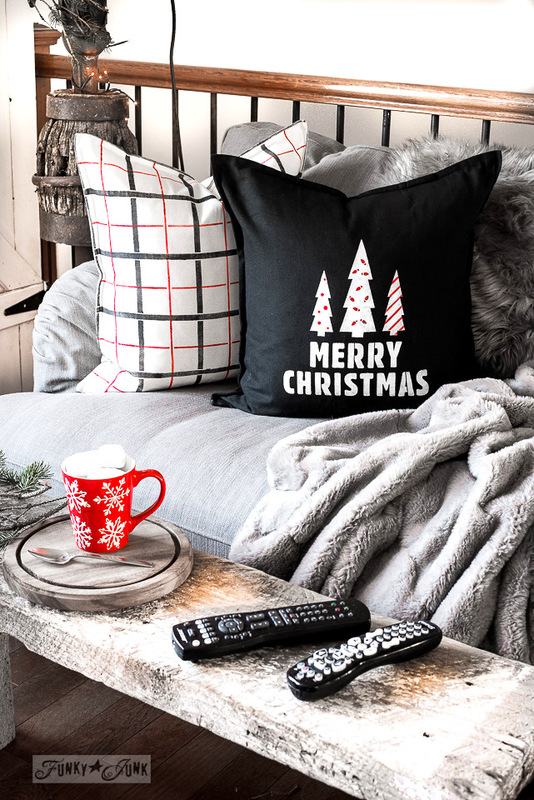 I even had it all planned right down to the throw pillows. So when it came time to finally make two of the pillows I imagined in my head, I ran downstairs for my red pillow cases… with none to be found. Where did they go?! I could have sworn… but I found my stash with every colour but red. RIGHT. Ikea WAS out of red that day. I had forgotten! So when I walked back upstairs again to mull over plan B… it took about 30 seconds to decide possibly an even better outcome! Red, white and black it is! 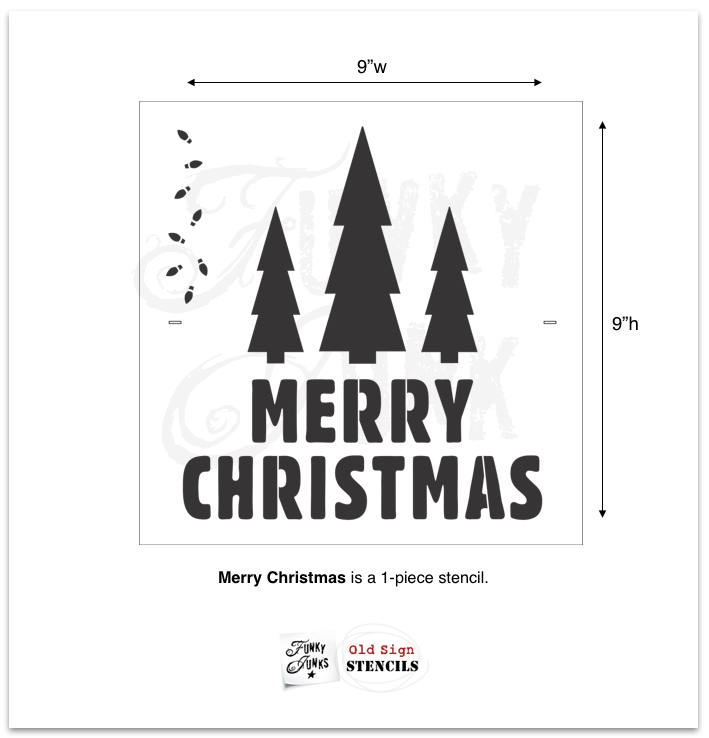 Merry Christmas is one of our new Christmas stencil designs. It was actually designed to be bold enough to work on top of buffalo check and to fit on 20″ throw pillows! But wow do I ever love the white on black. It just makes those graphics pop. 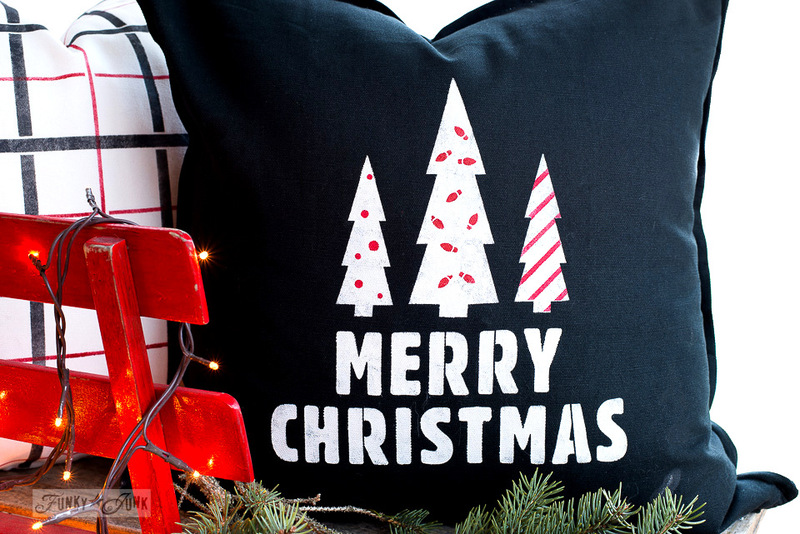 With emphasis on red decorations on the trees… I thought it turned out so cute! See those little Christmas lights? 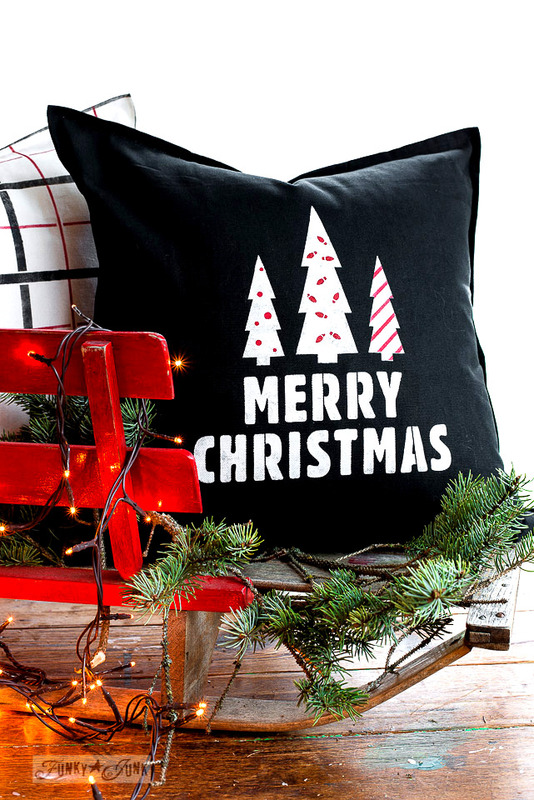 This stencil comes with a string of mini Christmas lights off to the side so the trees can be decorated. Fun! 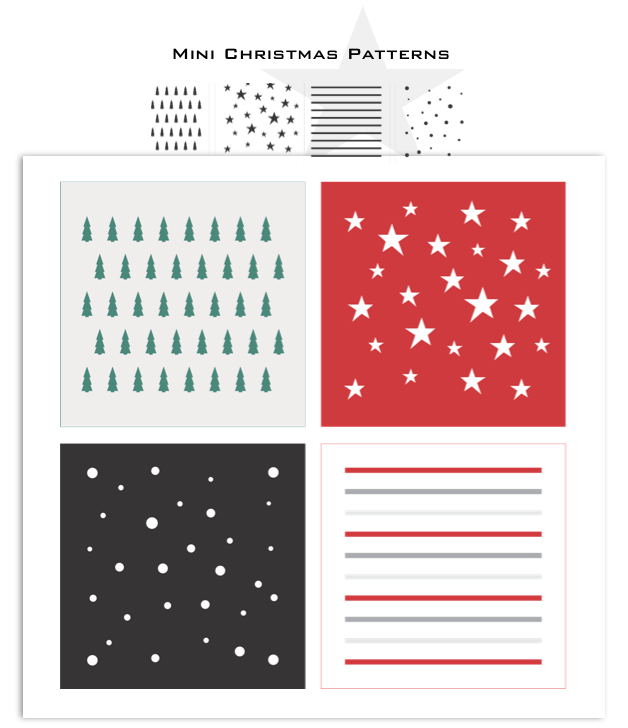 Mini Christmas Patterns is another new stencil kit, consisting of 4 compact patterns designed to use for small projects. And they were perfect for those little trees, were they not? … and the ash and red plaid won! It turned out fantastic! 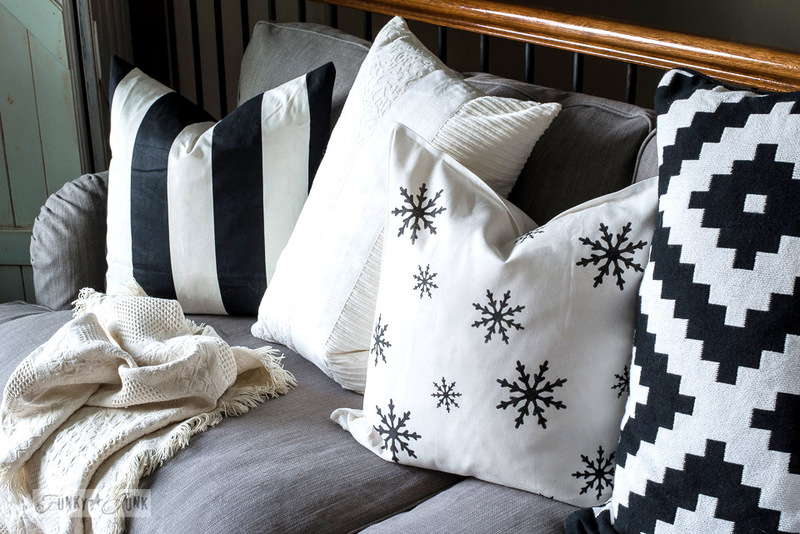 I love being the decorator of my own throw pillows so this one makes that easy. 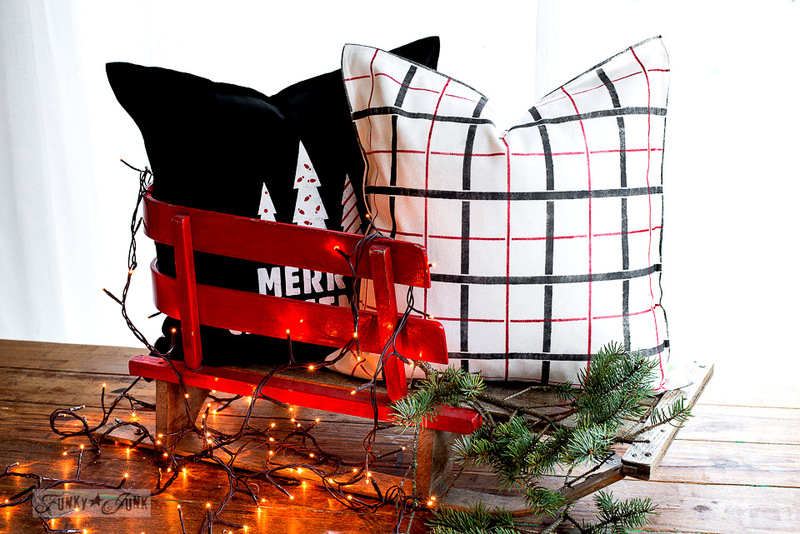 Click the video above to learn how to stencil in plaid. And of course, before the paint was even dry, I ran the pillows upstairs to try out my new toys! 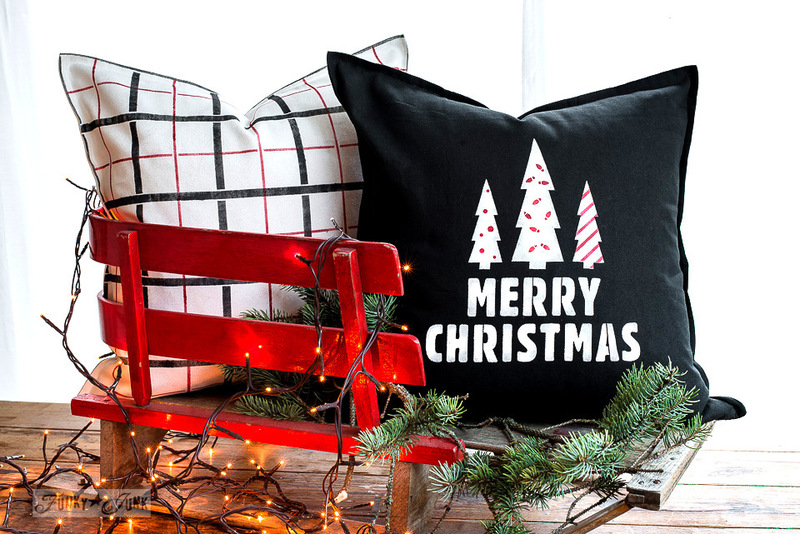 I think these red, white and black coordinating pillows are a mighty fine start to this Christmas living room! 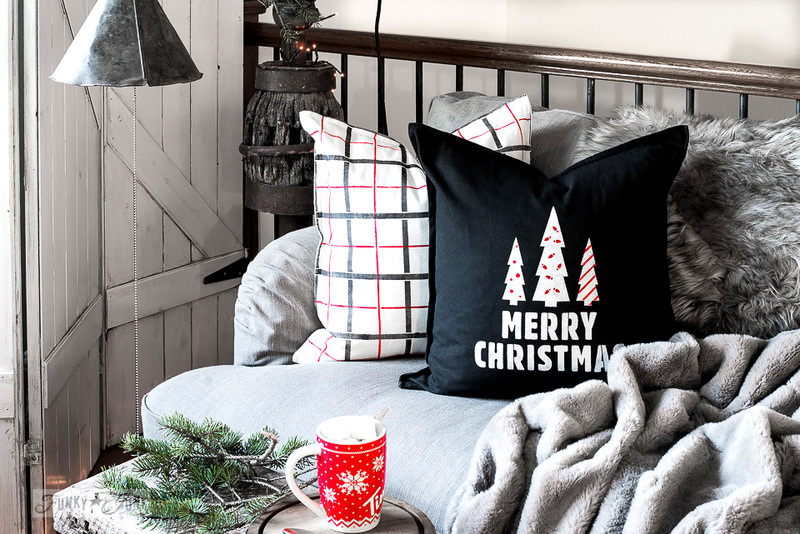 Are you designing any festive pillows this Christmas? Love your blog! I look forward to reading it every time it pops into my email. I love that fact that you’re Canadian. My family is from Newfoundland although I was raised in California. Your stencils are wonderful. I’m going to order a few today. Your creativity always make me smile and I want to copy everything you make. I just want you to know that I’m a fan. Keep it up girlfriend. I appreciate you! And thank-you for your interest in the stencils. I hope you share what you ultimately make! Thanks so much for all your projects! I wish you and your family and friends a very, Merry Christmas! BAHAHHAHA. Good ‘ol Timies is getting lots of free advertising. That mug is just too cute! But I’ve now stocked up on others so it’ll be fun to switch it out! Thanks for the kudos Cindy, it’s been fun creating again! Love the pillows Donna. Love the stencils. 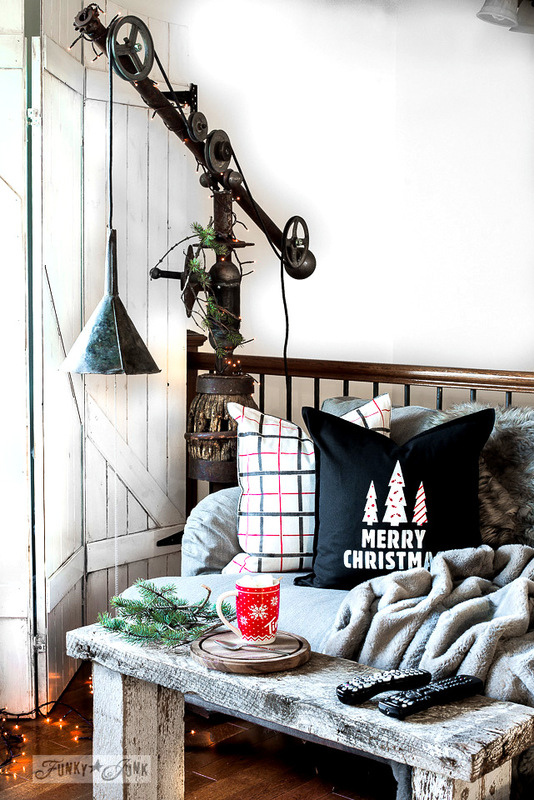 Love the light beside the sofa holding the pillows. Love the style. I’m gushing, I know. But I love stencils, rope, twine, wood in all degrees of wear and tear, and metal. Your stencil line is really great. I don’t know the ins and outs of stencil design, but imagine it takes some time. Thank you so much for offering your inspiration to us. Just as an aside. Something I really like is when a room is being built and the bare studs are standing there with no drywall or insulation up yet. There is wood going this way and that and you know what? I would love to have a room or a whole house that way, but I guess privacy and insulation is necessary. I think it could be done over the drywall. At lease I could choose one room. What do you think? Have a wonderful day! Thank-you Joanne! I know you get me. Nice to see you visit again!